Grisham referenced a Glogster poster project that I had done with my students around Three Cups of Tea, where they used media to present learning from the book and thoughts on their own lives. It was nice of her to include my students’ work as an exemplary, although the irony is that I have completely and utterly revamped the way we read that book. We now use Three Cups of Tea as our source for critical analysis – given that author Greg Mortenson’s veracity has been called into question and main events in the book are in dispute. It occurs to me that I thought I had put a note on that site — http://norris3cups.yolasite.com/ — to explain how we were now reading the book. I guess not. Still, I appreciate shout-outs in a publication like The Reading Journal. 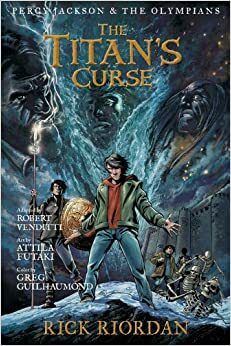 I’m sorry to say this, but even knowing the story of The Titan’s Curse (part of the Lightning Thief series by Rick Riordan), this graphic novel version of that novel is a confusing, narrative mess. If you never read the book … well, let me just say that it is unlikely you would have made it to the end of this graphic novel version. Which is too bad. The Titan’s Curse is a good story, with the introduction of Nico diAngelo and the emergence of goddess Artemis as a force to be reckoned with, and the start of the hunt for lost god, Pan, by Grover. But this graphic version of that story has few narrative anchors to let the reader know what is even going on. Sure, the visuals and illustrations are fantastic. You can see a lot of effort and creativity went into the art production of the book. If only some of those production costs were siphoned off to make the story flow and readable, but I fear that is not really the case here. The writing gets way short thrift to the artwork. What’s interesting is that they probably could have fixed this problem with a few conveniently placed text boxes, bringing the reader up to speed on the sections and scenes. Instead, we jump from scene to scene with very little glue to hold the story together, and some of the characters — who are clearly defined in the novel — look so much like each other, so figuring out which one is Thalia and which one is Bianca, etc., requires more effort by the reader than should be expected. Particularly if your audience is middle school readers, which this is. I’m all for challenging texts — and for graphic novelists using the parameters of the canvas to tell a story in a different way — but give me a chance to comprehend what I am reading. This version of The Titan’s Curse fails on that account. Revamped for the MakerText project this weekend. 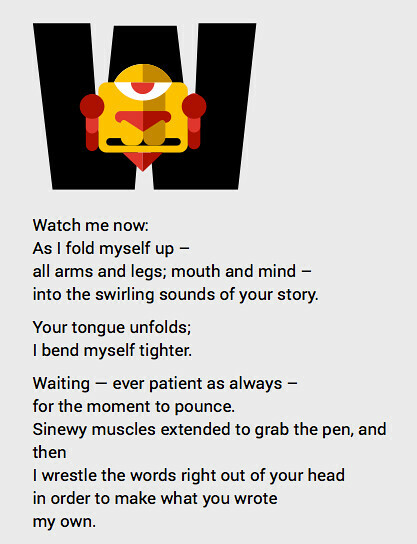 I could not spend the entire day yesterday playing with the project known as Read/Make, or Digital Writing MakerText, in which people are invited to create a crowdsourced novel collaboratively in just 48 hours (see premise/rules). But after a lot of writing in the morning, I did periodically pop into the Google Doc where the novel (on theme of how writing and reading is changing) is unfolding, just to see how things were faring. What was happening was magical and strange, and very fun to watch. (I created the word cloud about mid-afternoon from all the text, although there are links to videos and images and more, so it is merely a slice of the story in a moment in time). I’ve been contributing to a few chapters, including a skit about a bear and some kids. 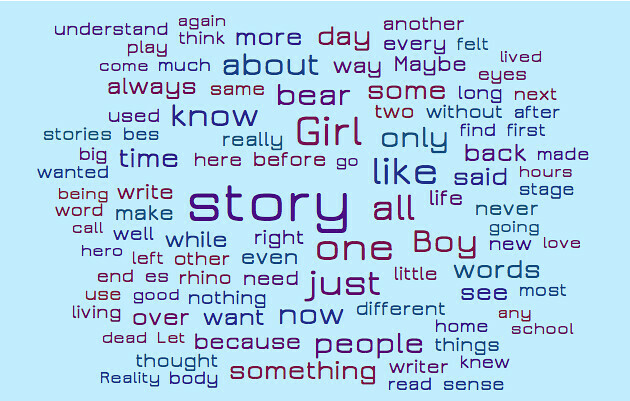 I started that one, and watching how others have come along and edited my ideas (the bear eats the kids), added to the story and then shifted it in some very different directions provides a very interesting view of the entire writing process. I’ve gone back in to format the writing into a skit, but other than that, I have just left it alone. I did not want the bear to eat the kids, but it happened, you know? Here, you have to let words go, and you write them knowing they are merely “gossamer” (reference to another chapter in the story) that might take hold or suddenly become transparent and disappear when another writer enters the page. How this entire document will hold together — what literary glue will emerge to bind the disparate parts — seems to me to be unknown at this juncture, mainly because we still have another day of writing. I suspect some grad student somewhere will have a blast with this 48 hour adventure, picking apart the way that distant collaborators write collectively in a digital age. It would be interesting to cull through the revisions, for example (if one had the time and inclination). One complaint about Google Docs for this kind of collaboration is that videos do not get embedded, which is a shame, since multimedia documents are anchored by video (and audio, which also do not get embedded into the story). You have to make links, which breaks the narrative. The reader leaves the page, and knowing how we read online, they might never return (particularly if there is a cat video in the YouTube recommendation sidebar). I found myself weaving in and out of the stories, adding a line here and there, and maybe a part of two. I felt reluctant to remove text wholesale, even though I know that is part of what we sign up to do. It still feels like theft or vandalism. Someone put those words down on the screen. Who am I to remove them? 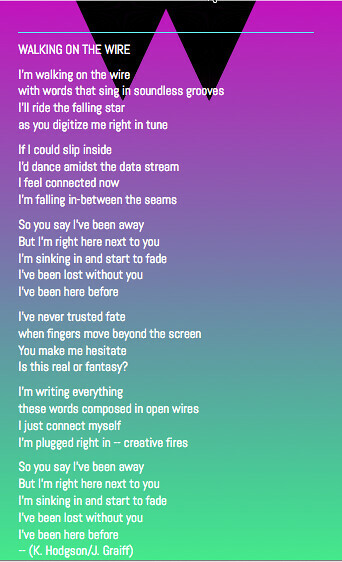 And yet … we are both the collective writer, sharing the screen together on a single piece of text. I have as much right to remove as they do to add. I think. This is where the idea of a MakerText is intriguing and emblematic of the age we live in. Who owns the words? Who owns the story? What role does the writer play? The reader? 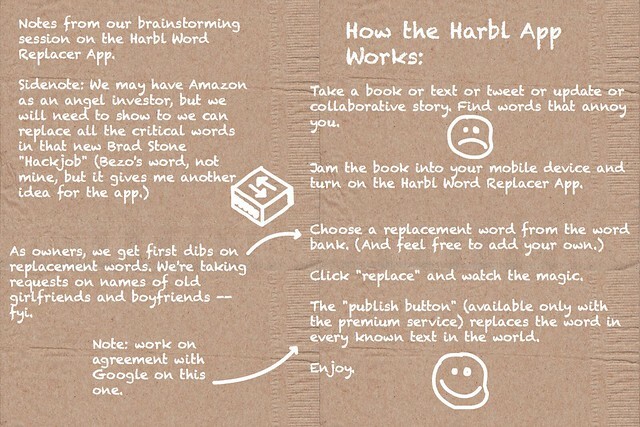 One of the chapters (which were set out through a collaborative brainstorming session prior to the launch of the story) had a term that I had never heard before: Harbl. It has to do with replacing words in text, partly in a snarky way to generate laughs and partly in a way to remind the writer to expand their vocabulary. I had to look it up. I created this visual, back of the napkin story, and here is where I was sort of wishing someone else would pop in and add to it. Yet no one has. The fact that no one else added to this chapter had me wondering about how different it is using image versus words here. If my words are in the text, you can change, add and remove my ideas. Not so with an image. You can completely remove it, but you can’t easily alter it. Maybe you can remix it (please, do) but it isn’t necessarily simple to do. Not like writing a word or paragraph. That story as image is mostly locked into place. I think I might go in and add some word buffers around the image, as a way to invite others to write with me. Will that change the collaborative nature of the chapter? We’ll see. I brought a group of teachers at a recent Professional Development session into Bitstrips to show them what a comic space looks like and to work around the idea of digital identity and avatar creation. Yeah, lots of laughter and giggling, and then thoughtful reflections at the end. That’s how PD should work, right? I’m popping in and out of an interesting adventure this weekend built out of last year’s Digital Writing Month. This year, over the course of a weekend, the goal is to construct a collaborative novel in a project called Digital Writing Makertext, or read/make. Sort of. Prompt: The novel we construct will be driven by a basic premise — not a plot, but a prompt. How that premise changes and evolves during the writing will depend on the contributions and their effect on the overall narrative. The author is dead. Print is dead. “Storytelling has changed. Stories are no longer told to audiences, but by audiences.” And now the very notion of the story is threatened. You are part of a crack team of storytellers, educators, students, and concerned citizens sent online to investigate the death of narrative. For this mission, you’ll need all the resources of the Internet at the ready… and cooperation from every corner of literature itself. Your job will be to write, film, record, and otherwise digitally construct a story about story itself — weaving your way through literary worlds and digital landscapes to write an account of the precarious health of narrative. It will also be up to you to resurrect the names, voices, and words of the greatest — and the most underrepresented — characters from literature, poetry, drama, television, movies, the Internet and more. We intend this to be a truly global writing experiment. Therefore, all languages are welcome in the text, any form of narrative is welcome, and any and all hyperlinks should link to open (not paywalled or password-protected) sites. The project is unfolding in a Google Doc and on Twitter, and who knows where else. I’ve been adding a few lines here and there, and created two “pieces” early on. The first is the video at the top of this post, and the second is this podcast poem called A Ransom Note from the Reader. into the swirling sounds of your story. for the moment to pounce. 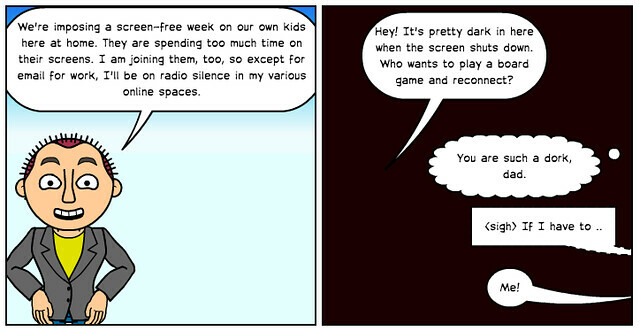 I’m back, after a week of mostly “no screen” in our household (my wife was at a conference all week, so I was the enforcer.) I gathered up some (handwritten) notes and observations and popped into HaikuDeck to share out a few ideas. Here are my Top Ten Things Noticed During No Screen Week. See you on the other side of the week. Thursday, Joe Dillon and I are going to be in a session to talk about the Making Learning Connected MOOC experience from the Summer of Making and Learning. You can bet we’re going to making some stuff. That session starts at 3:30 p.m. in the Hynes Convention Center as part of the NWP “c” sessions. Saturday, I am joining a bunch of other teachers to talk about nurturing teacher voice, particularly through writing and publication. I am going to share out about our Western Massachusetts Writing Project partnership with our local newspaper to feature WMWP teachers as columnists. That session — called Writing to the Community — is an early one, starting at 8 a.m. at the Sheraton. Sunday, I am giving an Ignite Talk as part of a collection of Ignites around the theme of Minding the Gaps. My talk is about video game design in the classroom. That is an early one, too, starting at 8:30 a.m. in the Sheraton. Finally, I have been asked by NCTE President (and friend) Sandy Hayes to share a vignette from my classroom as part of her President’s Address to NCTE on Sunday (following the Ignite sessions). I am honored to be asked by Sandy, and look forward to being part of a group of teachers telling stories of learning. That takes place at 10 a.m.
A few weeks ago, after we aired our Merry Hacksters Radio Show for DS106, my colleagues and I agreed that we would also release most of the individual radio files and segments so that in the spirit of the show — which is about hacking for change and remixing for good — anyone could take our files and use them individually or remix the entire show. We’ve even included the pre- and post-show discussions that took place on DS106 with Alan and Christina. So, here they are. All the files are in this folder and all are downloadable. We hope you might credit us if you do use the files. 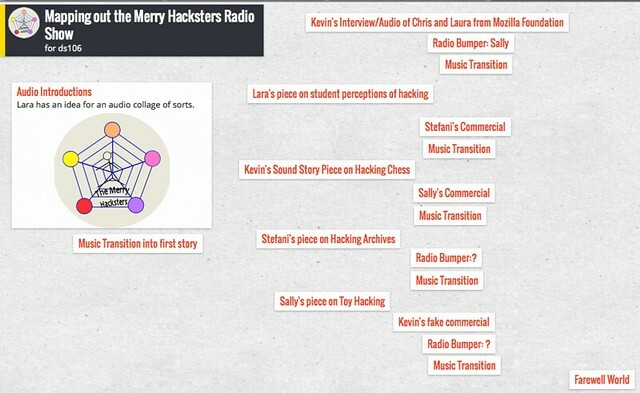 But feel free to hack and remix, and become part of the Merry Hacksters collective. If you’re here, you’re already one of us.